Scroll down for the #TwitterSmarter conversation report for July 5th, 2018 EST. When it comes to participants, we ranked 2nd among 485 conversations. In terms of the number of posts, we ranked 2nd out of 485 conversations that took place. This conversation ranked 5th out of 485 in terms of the amplification of ideas & content. There were 228 reshares, 24% of posts, during the course of the conversation. 49% of participants in this conversation engaged each other 459 times. 6% of participants in this conversation shared a total of 8 unique pieces of content. Hey guess what?! The #TwitterSmarter chat with special guest @cgritmon starts in 30 minutes. Grab some lunch or a drink & come hang. Madalyn Sklar. 6,681 likes · 56 talking about this. Ranked #1 Houston Social Media Power Influencer. Madalyn is also a blogger, podcaster and business coach who is known for her Twitter expertise. 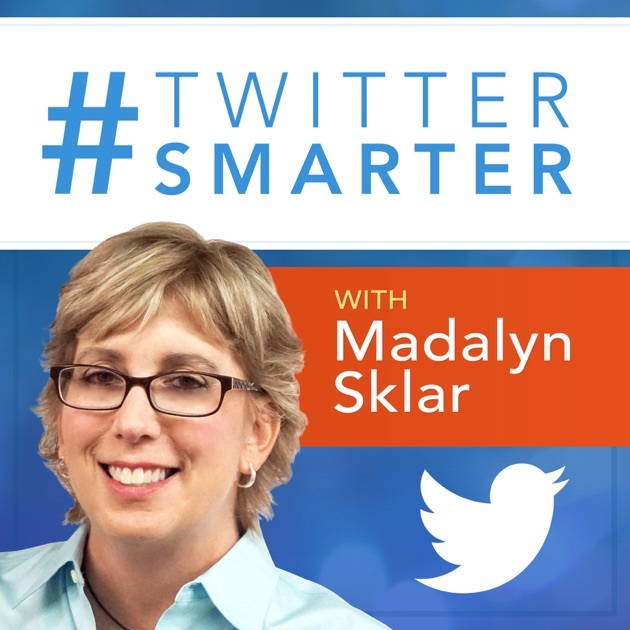 Download past episodes or subscribe to future episodes of Twitter Smarter Podcast with Madalyn Sklar - The Best Twitter Tips from the Pros by Madalyn Sklar: Social Media Coach. Speaker. Blogger. Twitter Chat Host. #TwitterSmarter for free. This podcast will make you a lot smarter using Twitter. The information and tips giving in this podcast help newbies get the most out of social media. I especially like the tools section given by experts. I have subscribed and I think you should too. Keep up the great work and you are always on trend with the latest information. I could go on but I'm starting to use the information and there is no time like the present.